A few months back, this plant was putting out lovely double-layered purple flowers that caught my eye at the pesticide-free market on the Chiang Mai University experimental farm site (Wednesday and Saturday mornings).I bought this purple/black datura from a retired Chiang Mai University botany professor who sometimes sells plants there on Saturday mornings. That market is a wonderful place. 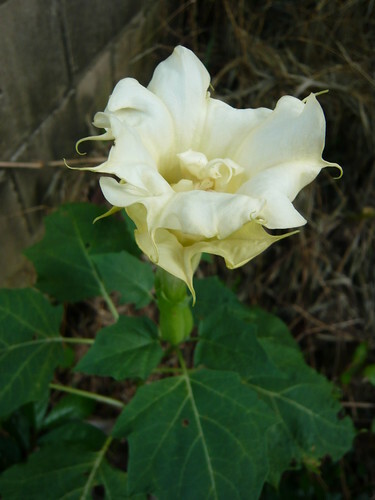 I bought a white double Datura as well. I took them home and put them in a sunny spot in the garden next to the Coleus and bamboo and surrounded them with sticks to keep the puppy away. 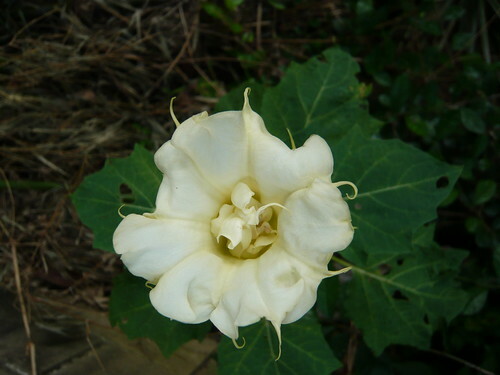 Datura is poisonous to dogs in even small amounts and causes uncontrollable reactions in humans if handled improperly or ingested. Contact with the skin can cause one to feel uncomfortable. Based on things I have read on the internet, eating this beauty could send one into the depths of a hideous nightmare, as it overrides the mind’s ability to distinguish fantasy from reality. In the US, one sometimes hears stories of people who eat Jimsom weed expecting to find god and instead end up blathering about monsters. Some websites even say that the flower, open at night, can invade one’s dreams. 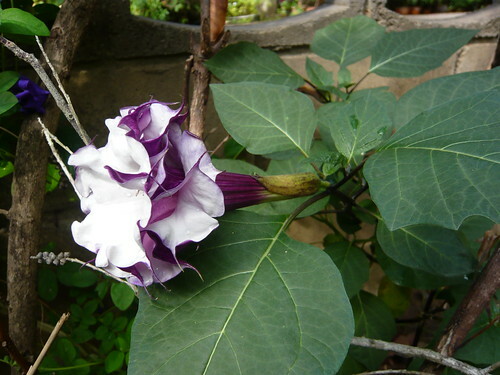 So I keep the Datura in the corner of the garden and usually do not pay it much thought, except to point the garden hose at it. I do not want to have an intimate physical relationship with this plant. Eric Danell, the fabulous director of Dokmai Garden (a must-see Chiang Mai garden), suggested we would have a hard time with the plant in Chiang Mai because he had tried to grow Brugmansia x candida (similar plant) in Sweden, but it “suffered terribly from the heat” of the Chiang Mai Valley. We shall see if these plants survive the hot season, in which case I hope a cutting can find its way to a more permanent home in Dokmai Garden’s dangerous plants section. 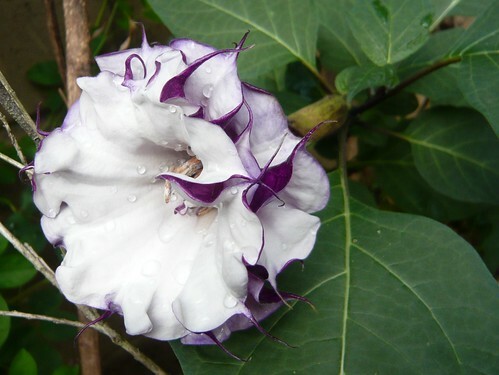 Here are some pics of the double white datura, the purple plant’s sister. You can see the double layer of petals instead of the triple of the purple. Written by: Farmer Jack on December 10, 2011. This entry was posted in flowers, psychotropics and tagged chiang mai university, coleus, datura metel, double blooms, eric danell, monsters, nightmare, purple flowers by Farmer Jack. Bookmark the permalink.